The factions have a lot of individuality, and that comes through in every aspect of the game. 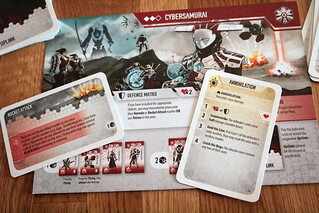 In this example, the Cybersamurai defend against a Dark Swarm attack. As the defender, they get to choose one option from the Dark Swarm attack card. But since the defense effects include the option to use the defending faction's defense action the Cybersamurai can activate one of their upgrades.